Thanks Dawn! I know, I love them too and bundt cakes are such an easy dessert to make! I need to make them more often! Your gingerbread bundt cake is definitely on my list to try! 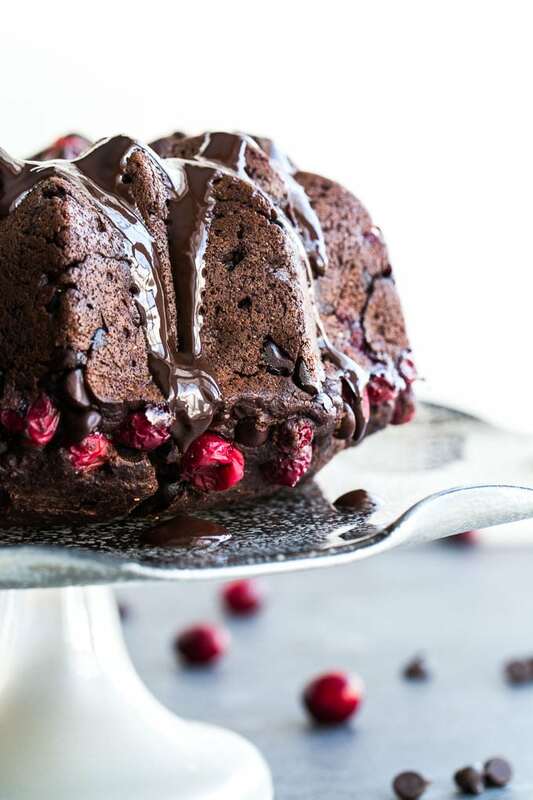 This cake looks so extra chocolatey and fudgy! Right up my alley. Love how the cranberries give it the acidity to balance out the chocolate! Great recipe, Leanne! Also I can’t believe Christmas is in 2 weeks either! ahhhhh!!! Thanks Haylie! 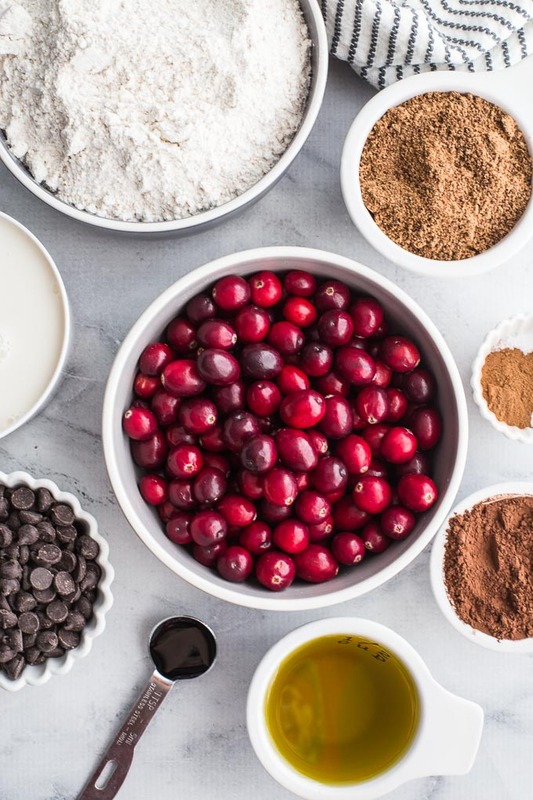 The tart cranberries definitely pair nicely with the chocolate, and the cocoa and chocolate chips create a fudgy texture. I’m planning to make this one again soon! Haha! Thanks Patrick! Glad I struck a chord with you! This cake? Made in one bowl? I’m in! Truth be told – I’d be in if it took 5 bowls! 🙂 Gorgeous dessert, my friend! Pinned! I just want to grab that slice right off my screen Leanne! 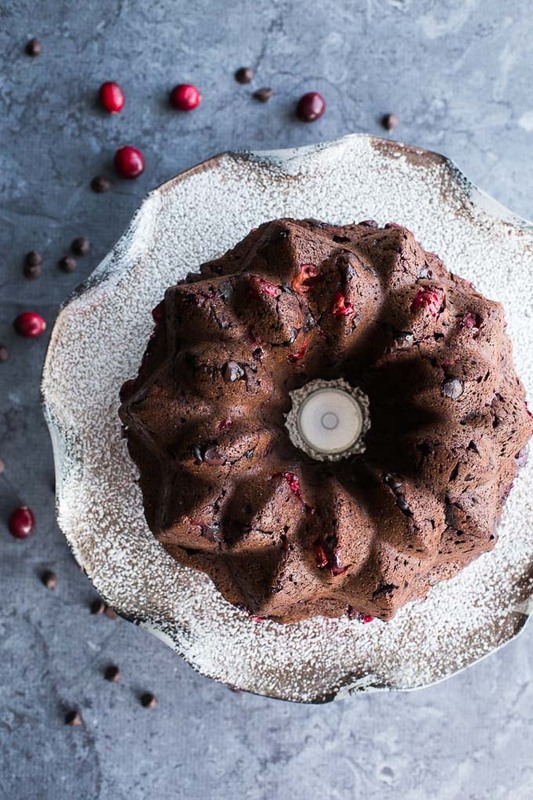 What a beautiful AND delicious holiday bundt! Well done! Thanks Mary Ann! I’m wishing I had another piece right now! This is SO stunning, Leanne. You’ve outdone yourself! Gorgeous pics, as well! 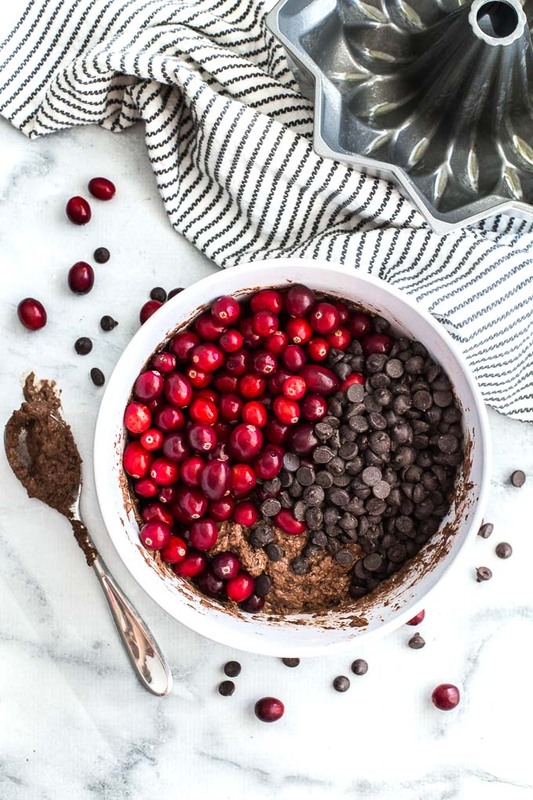 I am all about the fresh cranberries, and paired with chocolate you’ve definitely got a win! Thank you so much Katherine! Appreciate it. Cranberries and chocolate are definitely a great pair! Such a decadent and festive dessert! I love all process shots too – so well done! Thanks Tanya! That’s so sweet of you to say! Appreciate it! First of all, I’m totally with you. HOW are we so close to Christmas? It’s mind-blowing that 2019 is just around the corner. Second, I’d love a slice or two of your bundt cake so I can eat my feelings about a new year :). Have a great weekend, Leanne! Thanks Kelsie! Yes, the year just flew by! Wish I could share a slice or two of this cake with you! I love the way your cake looks! It’s gorgeous!! Pinned! Well as I don’t expect Santa’s arrival this year, the spotless house is the last thing I would think of 🙂 I’d rather embrace all the Christmas flavours and other significant elements like songs. 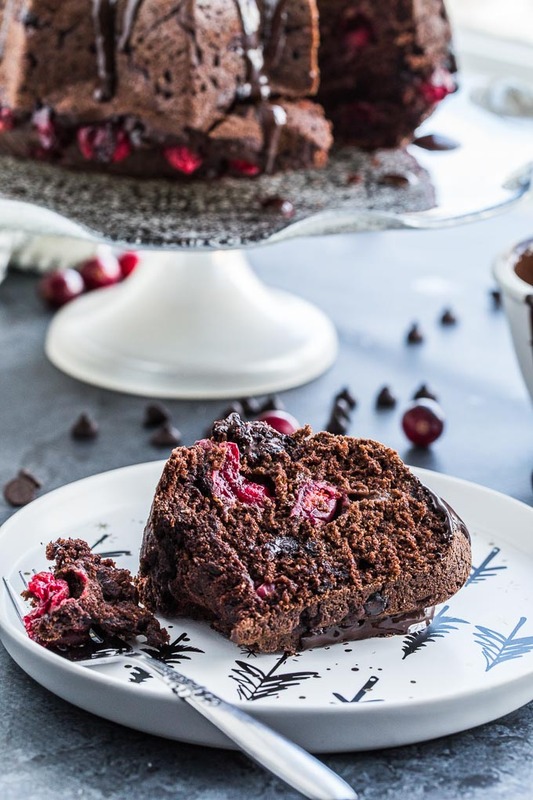 And I’d certainly be happy to embrace this chocolate cranberry cake – it looks and sounds fantastic! Thanks Ben! I love all that you are embracing at Christmas! Hope you had a lovely holiday season! This cake looks gorgeous Leanne. I’ve recently developed a big love of bundt cakes and bundt tins (I want yours by the way) and I’d love to try this one out. Great flavours and I love all the wholesome ingredients you use. Thanks so much Marie! 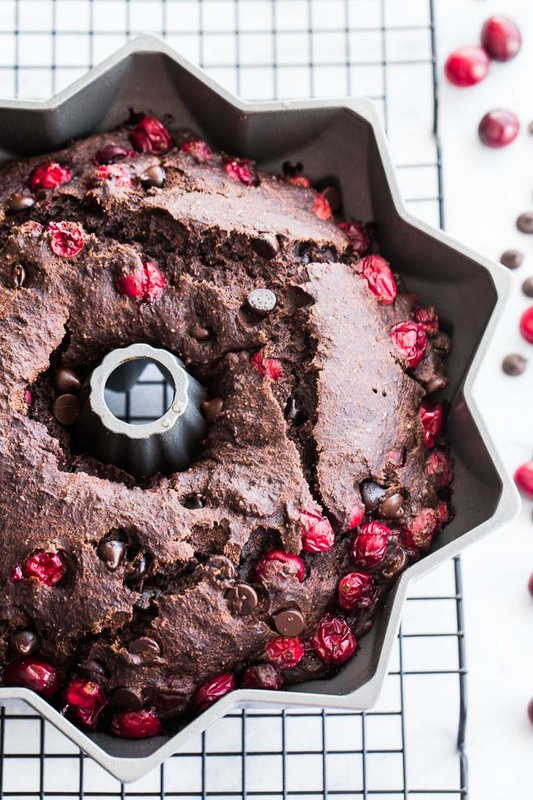 Bundt cakes are so easy to make. I really should make them more often! And I love my pan too. It’s new!! This is such a perfect flavour combination for this time of year. I love how the richness of the dark chocolate is balanced by the tart cranberries. Thanks for sharing Leanne! Thanks Yvonne! Yes, the flavours really balance each other out. And it’s not an overly sweet cake. Just lots of texture and fudginess! Your cake looks so delicious! Chocolate AND cranberries is such a good mix in my mouth. I will try to “veganise” it during the holidays. Thank you for the recipe Leanne! Thanks Nathalie! There are no eggs or dairy in this cake. To keep it vegan just use vegan chocolate chips! Hope you like it! What a beautiful cake! Your photos are gorgeous! 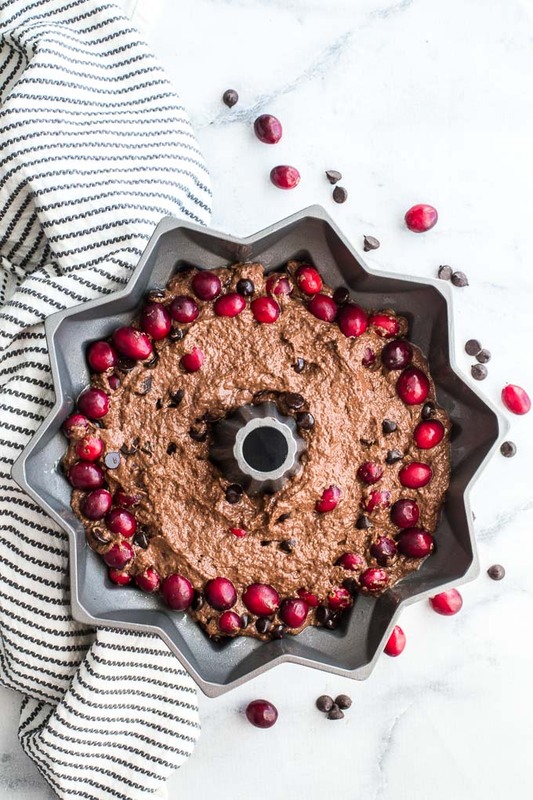 I love that the cake is all mixed in one bowl, and I’m also a big fan of cranberries. Thanks so much Cathy! The one bowl really is a time saver! I’m making this one on Christmas Day to take to dinner and it won’t take any time at all! I am with you, Leanne. 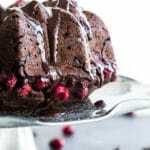 I love the combination of chocolate and cranberries. I am certainly going to give your lovely cake a try over the holidays – I have everything I need here to make it. I appreciate the dairy-free options as well. It is a beautiful cake that would certainly be a showstopper on the table. Thanks so much for sharing. Happy holidays! Thanks so much Denise! Happy holidays to you too. I hope you had a chance to make this cake. I made it again on Christmas Day, and it was so quick and easy! It made for a lovely Christmas dessert. Leanne, this is such a beautiful cake! I need to find some fresh cranberries and make it (I’ve been having trouble finding them here). I love that it is one bowl as well! Wow! Now THAT’S a showstopper cake! Love the combo of sweet chocolate and tart cherries! Pinned! Thanks Elaine! I’m definitely trying this cake with fresh cherries when they’re in season. Love tart fruit with dark chocolate! Thanks for pinning! Leanne, I love this combination! The chocolate drip looks divine.. Merry Christmas! Thanks so much Terri! I hope you had a lovely holiday season! Wow Leanne, this looks so amazing. I feel like I could eat this almost anytime of the year. Gorgeous! Thank you! I’m definitely planning to make it with other fruit throughout the year. Fresh cherries are at the top of my list!